Before you go much further I will trade this truck even for firearms but don't expect me to give out retail value on them. I'm selling my 1984 Chevrolet k10 stepside 4x4 with a 350/700r4 it has alot of new parts which includes radiator, gas tank, new true dual exhaust, brake lines, alternator, edelbrock intake, holley 600 carb, valve covers, rally wheels with beauty rings, new 33x11.50r15 bf Goodrich ko2 tires, distributor, wires, plugs, headlamps, radiator hoses. It has a small cam I'm not sure what size, Hedman headers as well. I removed the ac compressor and lines but still have them all as well as the original intake and quadrajet carb. 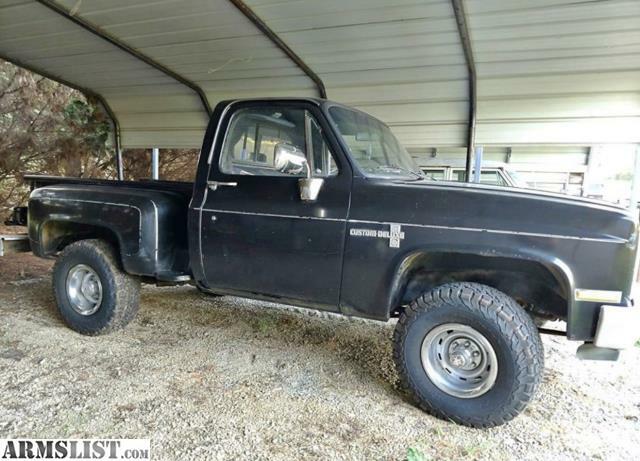 I may be forgetting some things but its a good running and driving truck that will make a great first truck or project for someone I've just gotten bored with it and want something else to mess with. It has usual rust for these trucks and it will come with new floor pans. Price is a little negotiatable but this is a good running driving four wheel drive truck and step sides are getting harder to find. Clean title in my name. I am interested in trades like v8 s10s, muscle cars, Silverados, jeeps, nice 4x4 atvs or sxs, don't be afraid to ask.